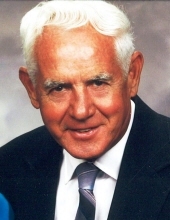 Roland Edward Swearingen, age 90, of Aurora, Missouri, passed away at 3:30 p.m. on Sunday, September 16, 2018, at Mercy Hospital in Aurora. He was born November 25, 1927, in Purdy, Missouri, the son of Ward and Opal (Wilson) Swearingen. Roland was a 1946 graduate of Mt. Vernon High School in Mt. Vernon, Missouri and served in the Missouri National Guard in Aurora for over 20 years retiring with the rank of Sergeant E-7. He worked for Carnation Milk Company and later for Mid Am Dairy in Mt. Vernon as a truck driver. He was an avid golfer and loved to work in his yard and garden. He was a member of the Aurora Eagles and the Church of Christ in Mt. Vernon. On September 23, 1950, he married Wilma “Buck” Mitchell in Eureka Springs, Arkansas. She preceded him in death on February 14, 2015. Roland is survived by his daughter, Janice Everett and her husband, David, of Aurora; two grandchildren, Shane Everett of Springfield, Missouri and Kayla Everett of El Dorado, Kansas; four sisters, Barbara Spilman, Marilyn Baugh, Evelyn Colley and Kay Scott and her husband Dale, all of Mt. Vernon; one brother, Jack Swearingen and his wife, Dolores, of Crane, Missouri and several nieces and nephews. His parents, Ward and Opal, his wife of 64 years Buck, sister, Jean Gambrell and her husband, Bill, two brothers, Alvin Swearingen and his wife, Arlene and Jerald Swearingen and his wife, Yvonne, three brothers-in-law, Jim Spilman, Harold Baugh and Bryon Colley and sister-in-law, Nancy Thomas, preceded him in death. A visitation will be held from 9:00-10:00 a.m. on Saturday, September 22, 2018, at the Crafton-Cantrell Funeral Home in Aurora with a memorial service to follow at 10:00 a.m. in the funeral home chapel. Burial will follow at the Maple Park Cemetery in Aurora. Memorial donations may be made payable to the Mt. Vernon Men’s Senior Golf League, in care of the funeral home. To send flowers or a remembrance gift to the family of Roland Edward Swearingen, please visit our Tribute Store. "Email Address" would like to share the life celebration of Roland Edward Swearingen. Click on the "link" to go to share a favorite memory or leave a condolence message for the family.